This dish is an old favourite of mine. Use either minced beef or lamb for Shepherds Pie. Fry the Mince and garlic and onion until golden. Add Tom sauce and tom puree, oxos salt and pepper and W Sauce and add some water to make as moist as desired. Cook at simmer for 20 mins. Boil or steam potatoes to make mashed potato. 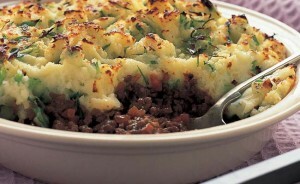 Place mince mixture into an oven dish and place mash on top and put in place with a fork. Add some milk to the top to get a nice crispy topping or add cheddar cheese. Heat in a medium oven for 25 mins or until bubbling. Serve with petit pois. Enjoy!